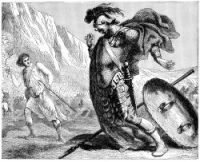 The Giant Goliath had a voice as terrible and frightening as his appearance, for when he cried out it was like the deep tones of thunder. 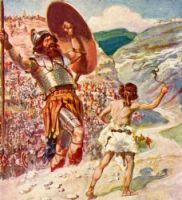 Relying upon his amazing strength and the massive armor that he wore, he marched down from the Philistine camp into the valley below and hurled defiance at the Israelites, challenging "the servants of Saul" to fight him. But no one was bold enough to approach. Every day, for forty days, the giant went into the valley near the Israelites' camp, and bellowed at them, returning to the Philistines at evening to gloat over his valor and the cowardice of the enemy. Eventually David arrived, without armor, and with only his staff, a sling, and five round stones he had picked up from a nearby brook. The Giant Goliath spoke scornfully to David, but David replied that he had come as a servant of God, in whom he relied for victory. He ran swiftly towards his huge antagonist. 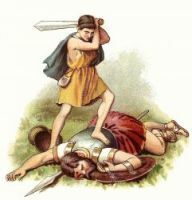 When within a few yards of Goliath, David placed a stone in his sling, and whirling it twice about his head, let the missile fly. In another moment the two armies saw the mighty giant stagger and fall forward onto his face. The stone had crashed through the giant's forehead and deep into his brain. 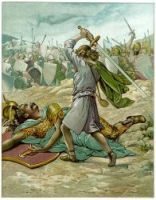 David ran towards his fallen foe, and used Goliath's sword to cut the giant's head clean from his body. He held it aloft to show both armies how he had vanquished the vain-boasting giant. These images from of the Giant Goliath are from my collection of antique Bible books. Feel free to use these pictures of the Giant Goliath in your artwork. Click on the Giant Goliath illustrations below to see more details about saving a free Giant Goliath image or about purchasing the images of the Giant Goliath at a higher resolution.